Now you’re saying “Hold on there Mr. Maniac! Nunchucks ain’t safe!” To which I say, you just need to make them safe. 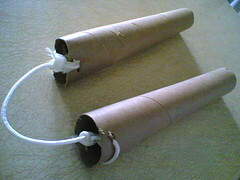 Oh sure, you could just go out an buy Rubber Foam Nunchucks from karatedepot.com, but what fun is that? 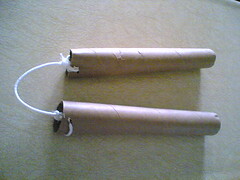 Wouldn’t you rather spend time with your children making your own (safe) nunchucks? Of course you would! What parent wouldn’t?